Jacques Le Vallois: There is undoubtedly a good reason why Peter Brook’s Meetings With Remarkable Men ends with a sequence of sacred dances; I felt it was one of the strongest parts of the whole film. They are unlike any dances we ordinarily see performed in public. The exactitude and precision of the gestures seem to obey a certain order; and then they don’t seem to be natural movements, but rather give the impression of being the result of a long, special training. I have to say that these dances touched my emotions in an unaccustomed way. So I’m very glad to be able to ask you some questions today, to find out more about them: what they mean and how they produce such an effect. First of all, I’d like to ask: what meaning did Gurdjieff attribute to them? Pauline de Dampierre: In the book from which the film is taken, you will find some very important indications of that meaning, and they are surprising for us because they don’t seem to coincide either with our idea of art or with the devotional aspect of sacred dance. Describing his stay in the monastery shown in the film, Gurdjieff tells about watching the priestesses work. They had to learn a number of postures and reproduce them very exactly. 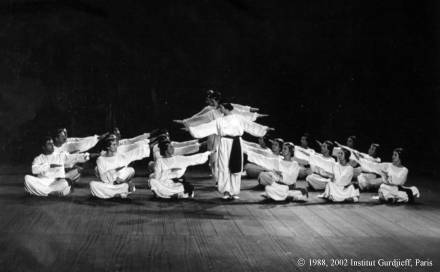 He says that these postures have a meaning, and that they constitute an alphabet; so in the evening, when the priestesses dance in the great hall of the temple, the brothers can read in these postures the truths that were implanted in them several thousand years ago and which are transmitted in this way from one generation to another. He was astonished by the precision and the purity of the positions, and touched by them without yet understanding what they meant. We are in an analogous situation. And in fact, the way in which we are touched is our best approach to the whole new world that these movements can open. You only had glimpses of a few of them in the film. Jacques Le Vallois: Yes, they were evidently incomplete. How would you describe these dances? Pauline de Dampierre: How to describe them—perhaps there’s no better way than the answer Gurdjieff gave his pupil Ouspensky, when he told him to imagine that there was a mechanism for studying the planets which represented visually the laws governing their movements, reminding the onlooker of all he knows about the solar system. He said there was something like that in the rhythm of sacred dances; and he stated enigmatically that through these strictly defined movements and the patterns made by the dancers, certain laws are made visible and intelligible to those who know them. And I would add that Gurdjieff made his pupils feel the significance of these dances much more by his presence and the influence it exerted than by explanations. He led his pupils to try constantly to relate their work to the central element of consciousness which was the foundation of his teaching. Jacques Le Vallois: Is practicing these movements a way of approaching Gurdjieff’s teaching? Pauline de Dampierre: Yes, one of the ways. You may imagine how difficult it is to sum up the essence of this teaching in a few words; let’s just say that it allows a person to feel in him or herself the existence of two poles. One pole corresponds to one’s real possibility, if one is willing to look for it—the awakening of consciousness, the development of being, presence to oneself. The other pole corresponds to the way we actually live, enslaved by our automatism, our passivity, our sleep. To try to wake up and escape from this sleep could be the direction of our whole life, at every moment; special conditions and an exceptional method of study are provided by these dances. Jacques Le Vallois: Where do they come from, these dances—or rather “movements,” as you call them? Did Gurdjieff find them on his travels, or did he compose them himself? Pauline de Dampierre: Both! All his travels and research were for the purpose of mastering the knowledge of the laws that govern the lives of human beings. The same laws are behind the ritual dances which he saw in many places, and it is according to them that the dances were composed. He learned that the law governing our slavery and spiritual sleep decrees that the automatism of our thoughts and feelings is closely bound up with the automatism of our movements and postures. That is the magic circle from which the human being can never escape by himself. But a series of new postures, proceeding from a real knowledge of a different order of laws, can open us to a different order within ourselves that would free us, unify us, and awaken us to the real meaning of our lives, so that our real being could act and make itself heard. This is the “science of movement” which Gurdjieff rediscovered. Jacques Le Vallois: Seeing these dances for the first time, I had the strange impression of “jamais vu”—something I had never seen before. What I saw was a perfect, harmonious whole. Also, there seemed to be a kind of osmosis between the dancers. How much time does it take to reach this degree of perfection? Pauline de Dampierre: I would say that it takes an entire lifetime for someone finally to reach the beginning—but the beginning of something immensely great. Anyone can begin to do them, but this approach will bring a person into a long process where he will find out that he is not prepared. The preparation must be a gradual one—a gradual increase in the difficulty of the movements and also in the inner resources which are called on. These postures often require movements that are not associated with each other, which the body’s automatism does not make naturally; and also the sequences of positions are hard to memorize. The automatism itself has to adapt itself. Before beginning to work on the sort of dances you saw, a lot of preparatory exercises are necessary which require a sustained attention. The first requirement is for the correct, pure position; otherwise the meaning is lost. Jacques Le Vallois: How is the idea of purity to be understood in relation to position? Pauline de Dampierre: The position becomes something less unconscious. Schematically, let’s say that it’s a firm, balanced position, that allows the person to maintain an inner presence while making a simple gesture, followed through without tension, without any useless or involuntary expenditure of energy. One has to feel the position, have a living impression of it, for it to be right and pure. And this sensitivity does not develop just by itself. It’s necessary to have an outer attitude that corresponds to the inner one. Jacques Le Vallois: Does that require a special attention which allows the execution of the right movements? Pauline de Dampierre: That is a first stage. Jacques Le Vallois: The music accompanying the dances is quite unlike anything I have known before, although certain harmonies perhaps are reminiscent of Near Eastern ones. How does this music act on the dancers? Pauline de Dampierre: Through the harmonies—but above all, through the composition of the music. Music also can belong to different orders of laws. Its structure, its harmonies, its melody, and its rhythm must accompany not only the outward movements but also the inner impulses which develop progressively in the course of the exercise. If the quality of vibration is right, it will awaken its counter-part in the dancers; it will not carry them away nor distract them. It continually brings them back to themselves and to their need to be open. The person who plays for the movements also has an active role. I will give you an example: you see that each of the exercises has a certain tempo which, like all musical tempos, is indicated on the score in the usual way—lento, allegretto, and so on, and sometimes by the metronome marking. But the metronome is not a sufficient guide. The same tempo that has given a peaceful, collected impression will seem at another time unbearably slow; or one which allowed a vigor and force to appear will now seem hurried. The right tempo is felt when it is in harmony with the inner state, and when the musician allows this harmony to come through his playing. Then the sound itself is transformed and it sustains the effort of the dancers. Jacques Le Vallois: Could one say that there is a sensation which is a sort of central point of reference, corresponding with a right movement? Pauline de Dampierre: If that were all, the movements would not have their real meaning; they would not be connected with the basic question with which this teaching confronts us. Again and again, while making the movement, the pupil tries to return to himself and to remember the direction of his search. He must have a deeper, more relaxed, more sustained attention. He feels the great power of his automatism and discovers that he is much more its prisoner than he thought, because the moment he gives in to it, he is lost. But if this attention is sustained, a new energy appears which is higher and more active, which awakens him to himself. The body relaxes completely and begins to participate in a freer way; a new intelligence accompanies the movement. At that moment, the pupil approaches the “exact doing” of which Gurdjieff spoke. Pauline de Dampierre: A state of grace—yes. Above all, the dancer experiences that this state asks for much more than he could have imagined. The execution of the movement is a test of truth which doesn’t permit cheating: there has to be exactitude in the gesture, obedience to the rhythm, absolute order governing the rows of dancers, unanimity of movement; and at every moment he feels his inadequacy. If he imagines that he can put his trust in a state of grace, his clumsy movement reminds him that his timing is wrong. One of the big discoveries to which this work leads is that the body has to be taught. It is full of tensions, full of all the results of its way of behaving, and not ready to be animated by a state of grace. If the struggle lasts long enough, a moment comes when this state becomes, for an instant, a reality. Then there is a real coming together: body, feeling, and thought are united. The pupil experiences a demand such as he has never felt before, the need to be nothing but an instrument; and he has never before felt so alive, so independent, so truly free. Jacques Le Vallois: Is this very special state related with something that could be called a different energy or vibration? Pauline de Dampierre: It is certainly related. Sometimes other expressions are used: density of matter and density of vibrations, degree of vivifyingness; but the term energy is more evocative of our own experience. Our ordinary states are connected with a certain quality of energy which has its own characteristics—for instance, a kind of heaviness. A more interiorized state is necessarily linked with a finer quality of energy that comes from a higher level; otherwise it cannot be maintained. If it is maintained, new relations are established between the functions of the body, the thought, and the feeling. You see, if I extend my arm this way, I spend a certain amount of energy. If I lower it, I again spend energy, and once more if I lift it again. But if I make a continuous up and down movement, I need much less energy. With that he showed us that a momentum, something like a sustained musical note, could be established that would support an inner state. In practice, this momentum can be of quite different qualities; it depends on the impulse to which it responds. If the rhythm is rigid and mathematical, if it is “anti-rhythmic,” no momentum is established. On the contrary, it may be disordered and out of control. But there can be a much more subtle rhythm connected with a very fine inner attention. In the moments of grace that you spoke of, there is sometimes such inner unity that one could say that the body moves with the rhythm in a conscious harmony. Jacques Le Vallois: Does the intellect—or rather, let’s say, the mind—act as a restraint? Pauline de Dampierre: Continually! It is much too ponderous, and it exerts a constant attraction. The attention that’s necessary doesn’t come from the mind; it has no name and no form. Jacques Le Vallois: Is what is asked for in these “movements” the core of Gurdjieff’s teaching? Pauline de Dampierre: As I said earlier, the movements provide conditions that are especially favorable and especially concentrated. What is central to this teaching must be lived also in all sorts of other conditions, in which the attractions of the outer world are much stronger. The experience of the movements would have no sense if it were limited to particular conditions. Its usefulness lies in revealing the possibilities and the difficulties of the whole human problem. It confronts the problem of manifestation. Jacques Le Vallois: You lay stress on the importance of the positions and their exactitude. Can it be said that they contain a symbolic meaning? Pauline de Dampierre: It all depends on what one is trying to understand. Analyses are not very useful. I don’t deny that each of these positions may have a definite, precise meaning, like the mudras of the Hindu repertory of gestures, which constitute a language for the transmission of certain information belonging to a body of knowledge. But it mustn’t be forgotten that the knowledge of which it speaks has always been linked with the perception of universal and human phenomena, interpenetrating and acting upon one another. These symbolic gestures were addressed to people who were steeped in this knowledge, as we are not. For example, in Buddhist art certain statues hold in one hand an oblong object which is a vase. It will be said, for instance, that this contains the Bodhisattva’s nectar of compassion; but it is also understood how this compassion is linked with the symbolism of water, the beneficent water which penetrates and fertilizes and unites. We don’t have this understanding. Jacques Le Vallois: The intellectual explanation of the symbol doesn’t seem satisfactory. One could say the same thing about the movements—there isn’t an intellectual explanation of them. Pauline de Dampierre: There could be one, even a very precise one; but it would be “for those who already know”—and they find it for themselves. One might say that in the symbol, two worlds begin to meet. By means of the symbol, a permeability appears between these two orders. Jacques Le Vallois: Can it also be said that the movements are the artistic expression of a knowledge? Pauline de Dampierre: In turn, I shall ask you a question: you saw some of these dances in the film. What did you think of them? Did you find in them a certain beauty? Jacques Le Vallois: The prevailing impression, I would say, was an unquestionable harmony of the whole that seemed to correspond with something true and adequate. But I also felt the beauty of the gestures, and I was very much moved by the music which accompanied them. Pauline de Dampierre: Nevertheless, while the movements were being performed, the aim was not to create a work of art. I would add that not one of the dancers ever thought of himself as an artist; not one considered himself a specialist in sacred dance. The dancers are usually people who lead active private and professional lives, and at the same time undertake this discipline in order to enrich their search. You spoke of harmony. What conditions are necessary for this harmony to appear? First of all, there is a canon, a lawful order. This canon comes from a knowledge: that of the relation between form and substance, between the movements of the body and those of the human psyche. Its goal is the evolution of consciousness. But this canon and this knowledge are not enough. The dancer has an essential role to play; without him, the harmony will not appear. He must not submit to this canon mechanically or passively; he must search. There is a question which concerns him deeply, and he must obey consciously. The harmony and the beauty will come from that. Jacques Le Vallois: The science you have spoken of, if I have understood, is a knowledge of cosmic laws. Would you say that this science, together with a certain open attitude of search, can create the necessary conditions for the appearance of a very high form of art? P. de Dampierre: Gurdjieff had a very lofty idea of what he called objective art. One of its characteristics is that it has the same effect on everyone. He described a moment in his youth when he and his fellow searchers found themselves in front of a very special work of art in a desert of Central Asia. At first, they thought it was a very ancient image of a god or a demon; but little by little, they saw that a whole cosmological system could be found absolutely everywhere in it, in all its details—even in the facial features. They found that they could decipher this system, and that they became aware of the feeling that had animated the creators of the statue. They seemed to see them and to hear their voices; in any case, they felt what these people had wished to convey to them. It’s not the ambition of those who study these movements to create a work of this sort; but in the course of their practice, sometimes a very special phenomenon occurs. It may happen that everything comes together so perfectly, with such a shared understanding, that their differences disappear. One doesn’t notice one or another person any more. It is as though one individual comes forward, raises his arm, turns his head; only one feeling moves through the whole and activates it. What occurs is an event. I wouldn’t go so far as to say that this is the manifestation of an objective law, but a prospect opens toward that horizon. Jacques Le Vallois: It seems a very far horizon. With nothing to orient them, what chance do people today have of reaching it? Pauline de Dampierre: First of all, I will say that this possibility opens only at moments. Perhaps people watching the movements have an impression of a whole, of harmony, of the release of an unusual force. They are touched, because it is not a professional performance that they are watching, nor a demonstration of the results of school work, but a living event that is taking place in front of them, with all its risks, its moments of rise and fall. The dancers themselves know this perfectly well; they feel the instability of everything that is happening in themselves. This is the price of the great moments they may experience. And then there is another aspect, which applies more precisely to your question. We have spoken up till now of this very high vista which unfolds, of a possible culmination of the search. But at the same time these exercises open a prospect that is very simple and very accessible. Anyone can approach them, whatever his capacities; and from that point of view, one can say they answer to a lack in today’s world, a need for renewal. These exercises are one of the disciplines one finds today—there are still too few—which point out the necessity of associating the body with an inner, spiritual aspiration. This necessity has been forgotten; the body lives apart, and we don’t feel the inadequacy in that situation, and the limitations which it imposes on every plane of our existence. We are given no taste of the body’s dormant possibilities; we don’t know how to listen to it nor to call it. But a relation could be established—and not only during the practice of a discipline. Those who participate in the work of the movements will tell you that the understanding which has come to them carries over into other moments, in the most ordinary situations. There is no circumstance in our life which need be cut off from it, not even taking the subway or sitting at one’s desk or walking in the street. So you see, we come back down to the level where we live. This interview—translated from the French—was first published in The American Theosophist, Wheaton, IL, LXXIII (5), May, 1985, pp. 175–181. Pauline de Dampierre was one of the intimate circle which gathered around Gurdjieff in the days of the Paris Occupation. Trained as an attorney and journalist, her central interest and occupation have remained in the study and practice of Gurdjieff’s ideas. Jacques Le Vallois is the editor-in-chief of the French monthly Aurores, a periodical devoted to the study of traditional civilizations and spiritual search.